This idea was seen and immediately stolen from my library BFF Tamara Cox, see her post here! 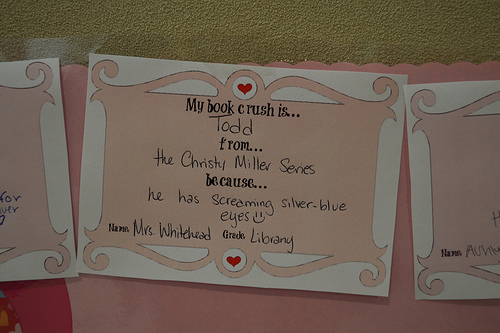 We are having a blast sharing our book crushes in honor of Valentine’s Day! 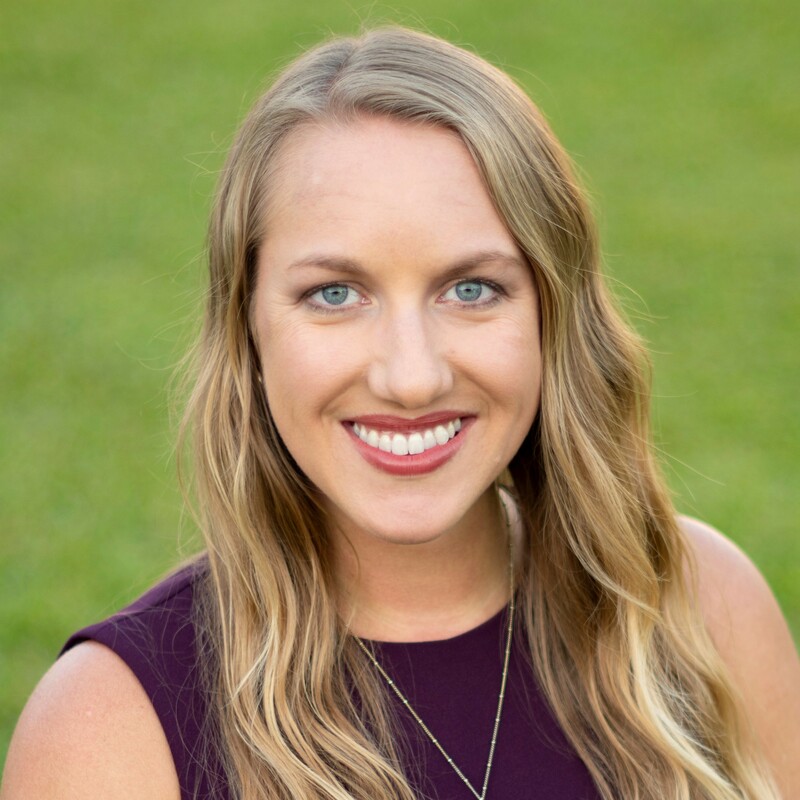 Both teachers and students are sharing who their ultimate book crush is — you can see mine below! It’s interesting to see how many of my girls share the same book crushes as me (meaning I’ve pushed my favorite books on them and they loved them as much as I did)! 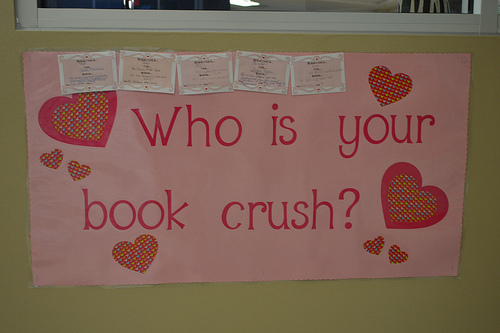 So I have to ask…who is YOUR book crush? Love it! I totally forgot about St. Clair. How could I?! My husband thinks it is strange that I could answer this question so easily with YA books. The Thief of Eddis/King of Attolia. Still. I’m stealing Tamara’s idea, but using your template! My first book crush (many, many years ago) was Calvin O’Keefe from A Wrinkle in Time. He liked Meg even though she wore glasses and was clumsy and moody. I identified with her at the time! Oh my goodness…I love the Christy Miller series and Todd totally set the standard for a boyfriend for me. That makes me so happy to see someone else who loves him :). I hadn’t even thought about those books in years. I love this idea! I’m an elementary LMS so this probably wouldn’t work in my library but if I was in a high school I would totally use this. I’m not going to lie, I love Finnikin. And a whole slew of other hunky guys from YA books, but most recently, Finnikin. Oh, and Duval from Grave Mercy. I can’t wait to use this display. I’m actually creating my own version of the book crush handouts right now because I was just getting ready to put up a “Fall in love with a good book” display today when I saw this. Yay! Thanks for the idea (and thanks to Tamara Cox)! I am from Mumbai, India and I discovered your blog from the edublog site. I love your ideas.I am a senior school librarian at a Mumbai School. Your valentine day theme has given me some ideas and I am in the process of creating one tomorrow. Thanks a lot. I am interested in your Book challenge but need to know how do you know the kids are reading genuinely or they just filling up the log card for prizes. Please keep me posted on more of this.